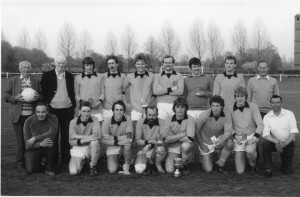 c. 1980. 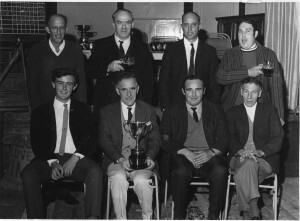 The Factory Skittles Team with the Leonard Maggs Cup. Front row – Roy Perrott Jun. Fred Bradbury, David Jenkins, George Young. 16th. August 1987. Opening of new clubhouse by David Bryant. 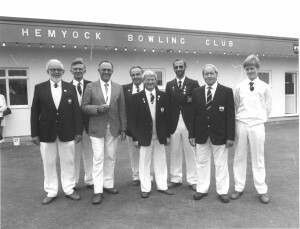 L to R. Reg Hotten, Don McCulloch, David Bryant, David Jenkins, Bob Hackwood, Martin Dear, Fred Lawrence, Gareth Dear.